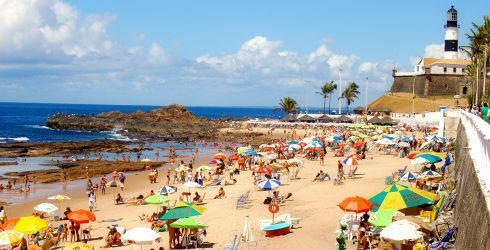 If you have a group of friends considering a trip to Brazil, Group Travel is a great way to travel. Few things in life are more exciting than a shared travel experience with a group of friends, sampling the nightlife and culture. From the extensive beaches to the Amazon River, it's easy to find an itinerary to cater to everyone. It is a fact that most groups traveling together can get exclusive discounts if traveling in Brazil on a single reservation. And just for being the organizer, if you have enough people you might be able to get a free hotel and discounts on your airfare. Group itineraries can be difficult to prepare as you must take into account not just the group's needs but also cater for the individuals on the trip. The best group trips are planned by someone who has firsthand experience working with groups as well as destination knowledge, so that everyone feels like they're getting a good balance of group time as well as time to go off exploring and have some independence. Selecting the right professional to craft that perfect group travel Itinerary is often a bit of a difficult decision. You'll want someone who has knowledge of the destination to make good recommendations, but also someone who can guide you to the right balance in the itinerary. If you already have a number of people interested in group travel to Brazil, the go-today team can help you finalize those plans. If you already have a good idea of what you'd like to see and do, we can review your plans to make sure you haven't overlooked anything. If you haven't done any planning, we can put together the perfect group travel itinerary to make the most of your trip. Larger than the United States, Brazil takes up nearly fifty percent of the South American continent. It has a rich cultural history that both blends and contrasts with its neighbors. The Portuguese explorers influence combined with the native Indians and African slaves to give it the diversity you see today. Rio de Janeiro is unlike any metropolis, sandwiched between tropical beaches and stunning mountains. There is never a dull moment in the city of sizzling Samba that exemplifies their zest for life. View the complete day to day Brazil: Rio de Janeiro, Amazon Itinerary. This tour offers you the best of the city combined with the best nature has to offer. Rio de Janeiro is unlike any metropolis, sandwiched between tropical beaches and stunning mountains. There is never a dull moment in the city where Samba reigns. In contrast, youâ€™ll also delve into a more natural scene, getting drenched by the powerful river as it tumbles over Iguassu Falls. Located on the border of Brazil, Argentina and Paraguay, its beauty and magnitude will live on in your memories. View the complete day to day Brazil: Rio de Janeiro, Iguassu Falls Itinerary.